Together with his associates, the head of Fortuna sold the second biggest local betting company to a Czech-Slovak financial group Penta. The sale will earn Horáček roughly CZK 2 billion. The director of the Czech branch of the software company SAP became the head of SAP for the entire central European Region. Bednár’s responsibility will now include not only the Czech market, but also the Slovak, Polish and Hungarian markets. The Walach brothers (owners of the Walmark pharmaceutical brand) bought ProFitness, a company that owns Vitaland, a chain of health food/vitamin shops. At the same time, they stopped production of beverages and sold nearly the whole division to the food company Maspex. They will keep only the beverage plant in Český Těšín. This entrepreneur who attempted to barter with state subsidies from the ministry for local development is now being investigated for corruption. The minister for local development also sued him for slander for saying that subsidies can be obtained for a bribe. České dráhy had losses of around CZK 750 million in 2004, despite long-term attempts to recover the state transporter. According to its CEO, there is fierce competition among private railway transporters and trucks, due to Czech EU entry. The entrepreneur who contributed to the arrest of former chief of the Centrum kuponové privatizace (The Voucher Privatization Center), Jaroslav Lizner, is now facing police accusations of fraud and tax evasion worth CZK 9 million. Due to his failure to appear in court, he is being prosecuted as a fugitive. 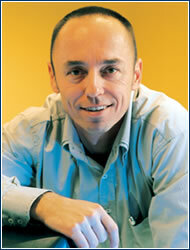 MIROSLAV ŘIHÁK (42), the general director and chairman of the board of ANECT, a company that supplies goods and services for large communication and information systems, was named Entrepreneur of the Year 2004. In the competition, which Ernst & Young organizes annually, the panel rated entrepreneurial spirit, economic results, corporate strategy, and the contestants’ personal profiles. The judges unanimously chose Řihák, whose colleagues entered him in the competition. “Winning surprised me a bit, since I saw it more as a game, but of course I’m very pleased,“ says the winner with genuine modesty. ANECT employs 180 workers and boasts CZK 500 million in annual revenues, as well as customers like DHL and Česká pojišťovna. Řihák claims that people are his firm’s main competitive weapon. “We sell team know-how, and our strength lies in our being able to create solutions for clients that no one else offers,“ he says. A technically-trained cyberneticist, Řihák’s greatest enjoyment comes from dreaming up new projects. But he doesn’t have much time these days for creative work, as he spends a lot of time with managerial work and traveling from Brno to the Prague and Bratislava offices. He travels up to 50,000 kilometers a year, so he wants to find a successor to take over his directorship. “But he’d have to lead the firm in the same spirit that I established,“ chuckles this native of Brno and father of two sons. In the winter he clears his head on ski slopes – “I snowboard with abandon“ – and in the summer on a yacht off Croatia. “When I’m surrounded by the sea I can feel the energy flooding into me from every direction!“ Řihák exclaims. THE MAYOR OF the southern Bohemian settlement of Kovářov, Pavel Hroch (42), has reason to be happy. The place he’s mayor of was named Village of the Year 2004, winning over 238 other municipalities from the whole republic. “I immediately called all my colleagues, representatives, and friends, and I received many congratulations,“ he laughs. “We won in the regional and national rounds, and I sincerely thank all those who did something for the village,“ this Kovářov native says. The parties that called the competition – the Regional Development Ministry, the Association of Towns and Municipalities, and the Union for Countryside Renewal emphasized the preservation of traditions, various association activities, work with youth, care of the elderly, and maintenance of public spaces. 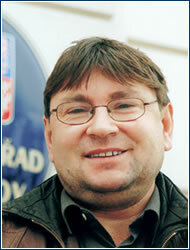 Until 2000, Hroch was a sales deputy for Motor Písek and later engaged in the truck repair business. In 2002 he turned his attention wholly to office work. Besides his feeling of triumph, he has lots to think about: the village will receive CZK 1 million for the national victory and a half a million for the regional win. Kovářov must add the same amount from its coffers and invest it in a project to develop the village. Hroch is considering whether it’s better to invest in a new bus stop or repair the school playground or buildings the village owns. “We have lots of plans, but it will all depend on the money – nothing’s decided yet,“ explains the mayor. A father of two teenagers, Hroch devoted his free time to training young soccer players ten years ago, but due to his current work load, he now simply enjoys the sporting life as a fan.